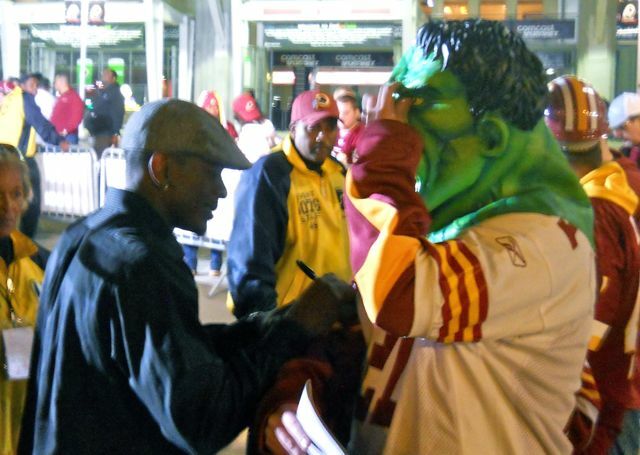 Redskins receiver Anthony Armstrong signs an autograph after Washington's 27-24 loss to Indianapolis Sunday at FedEx Field. Photo by Mike Frandsen. The Redskins may be the oldest team in the NFL, but Washington has some young players contributing this year more than in recent seasons. Brandon Banks is electrifying as a punt and kick returner. Ryan Torain had 100 yards rushing and two touchdowns against Indianapolis, and backup running back Keiland Williams had four receptions including one for a touchdown. Receiver Anthony Armstrong also made five catches. Maybe the decisions not to sign Brian Westbrook and T.J. Houshmandzadeh weren’t so bad after all, because it allowed the Redskins to give playing time to younger players. And as badly as the Redskins have drafted in recent years, they have hit on their last three first round picks: left tackle Trent Williams, who shut down Dwight Freeney, linebacker Brian Orakpo, who had Washington’s only sack against Peyton Manning, and safety LaRon Landry, who made 11 tackles against Indianapolis to add to his team-leading total of 63. This entry was posted on October 24, 2010 at 11:29 am and is filed under Uncategorized. You can follow any responses to this entry through the RSS 2.0 feed. Both comments and pings are currently closed.